He's stooped, slow and doesn't speak – just what you would not want in an actual waiter. 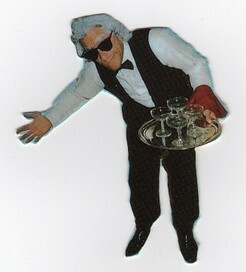 But the "THE OLD WAITER" roving show is very funny and includes a bit of close-up magic that will leave your guests laughing as he interacts with them. Performed on many occasions, here in NZ and overseas, with great results. "THE OLD WAITER" is great entertainment, to get your next special event started or as a late-night act. The fee quoted is for up to one hour of roving entertainment and is adaptable to your event's requirements. I suggest that you send a "question" to ask for your preferred date/time, before you bid. I will confirm my availability and commit to the exact day/time you require (conditions apply). Then you would be able to secure "THE OLD WAITER" by using the "Buy Now" option. The additional travel fee to be added, and any other questions you may have, can be sorted at that time. I was awarded the 2011 "Top Variety Artist" Award, by Variety Artists of NZ. I look forward to helping to make your event really fun and memorable! ...Fully booked for August, there are still dates available during September and October. Price shown is valid to end of October 2018, conditions apply.